Just two months in and the rigors of a Masters in a foreign country were already taking their toll: bags were forming under eyes; Whatsapp had become the sole means of communication; people were drinking Irn-Bru non-ironically. We were a mess and needed an escape. 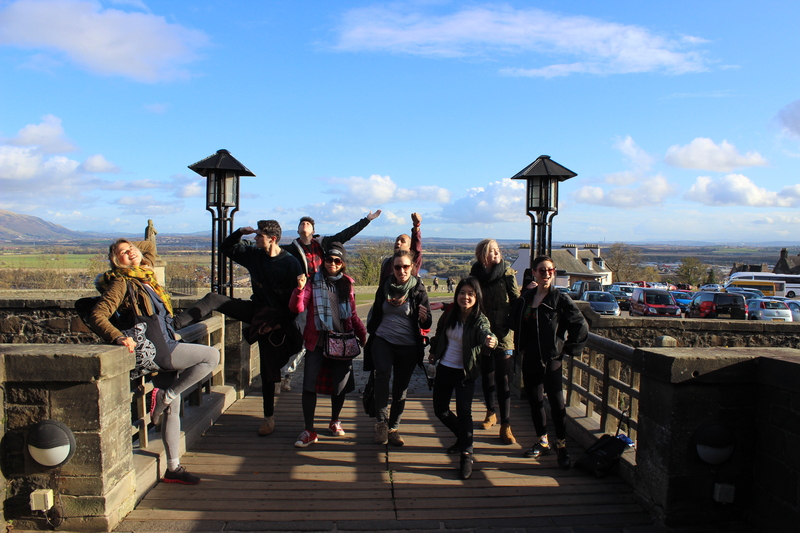 So, on a crisp, winter morning we hopped on a train to Stirling, deep in William Wallace country and took in its famed attractions (the castle, the playground etc.,) before taxi-ing to our cottage retreat. We took comfort in the taxi drivers’ struggle to find our destination – this would be a real escape, just what we needed. ‘Don’t get too drunk!’ he advised as he walked out the door, and, had we the time, we would have assured him that this was to be a mellow weekend of cultural exchange and sophisticated discussion. It’s being a cold November evening, no sooner had we taken off our coats than we were tucking into a round of hot toddies. A delicious home-made dinner soon followed, and we were joined by some of our more intrepid classmates who had decided to cycle from Glasgow, a quick, four-hour trip on some of the most well-lit roads Clackmannanshire has to offer. As the evening drew on, we retired to the more comfortable surroundings of the cottage interior. The night quickly descended into what has become customary of GLOCAL soirées – an exposé of international traditional dance. Beginning with an Irish céilí and Damhsa na Scuaibe (Brush Dance), we then moved east to Cambodia –Ruam Vong-, before quick-stepping to some Salsa, and finishing up in Hawaii. A fake Christmas Tree also featured prominently and was the source of much dance-partner envy on the floor. The next morning, we reluctantly arose from our extremely cozy beds and took advantage of the cobweb-blowing power of the Scottish countryside. Vibrant fallen leaves littered the winding country lanes, and our ramble along the red, orange and yellow floor below was soundtracked by the babble of a nearby stream, and the distant bleating of sheep. It was the perfect backdrop to some heartfelt conversation about who we were, where we were going and what it all meant. My Instagram post of the walk got 51 likes. I was content. The remainder of the afternoon was a much more low-key affair compared to the night before, and the country air had lulled us all into a drowsy mood. Board games and films were the order of the day. We lounged, we ate, we tippled, all in very welcome moderation. Bedtime came earlier that evening and we all slept like logs. Looking back on the weekend, it was the perfect mix of fun and relaxation, and I think we all feel very privileged to be able to go on these kinds of excursions. Much credit must go to Robin and Louise for organizing, and those who couldn’t make it can be sure that there will be many more weekends away over the next two years.